Why Monitor Configuration and Change? There are many instances of performance issues with business-critical services being caused because a server, network device, or application was not correctly configured. Human errors during updates to the configuration may also cause unexpected performance degradation. Knowing what configuration changes have happened around the time when a significant performance change was observed allows administrators to more accurately and rapidly identify the cause of a problem and to bring the IT services back to normal operation quickly. By eliminating guesswork, unified configuration and performance monitoring allows IT organizations to reduce mean time to repair, improve service uptime and reduce IT operations costs. 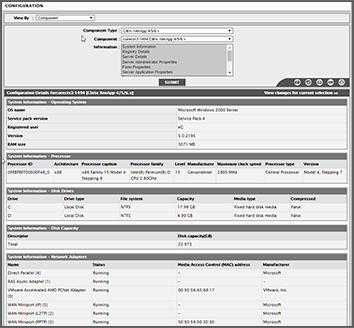 eG Enterprise provides administrators with the ability to view configuration and change management from a central web console (Figure 1). It employs agent-based and agentless mechanisms to extract critical configuration and change details from each of the managed components in the environment. 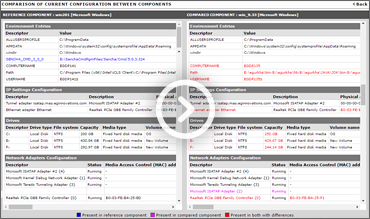 In addition to configuration data from the network and operating system layers, the eG Configuration Manager also obtains configuration information at the application layers. 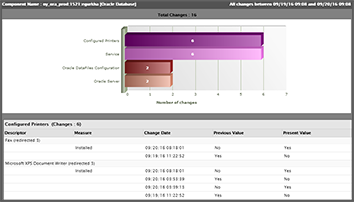 By tracking the configurations of a component over time, eG Enterprise also reports on configuration changes and when the changes happened (Figure 3). By time correlating change information with performance information, administrators can get vital clues as to whether any configuration changes (whether automated, manual, or unintentional) may have caused a performance degradation. Administrators can also use Change and Configuration Tracking to compare configurations across applications, servers, and networks. This way, if one server is performing well, but another is not, an administrator can quickly determine configuration differences between the two servers that could be responsible for the performance difference. Which platforms is a particular application currently running on? Is an unlicensed copy of an application being used anywhere? What are all of the applications currently executing on a particular system? Which versions of an operating system are currently available in the target infrastructure? Do any operating systems need to be upgraded? What is the current configuration of an application? Is all mandatory software (such as antivirus software) available and running on all managed systems? If not, which systems do not have such software? Are all services critical to the functioning of the system and applica tions up and running? Has a particular software patch been applied to all target systems? Do any systems require additional hard disk space? If so, which ones? Do any systems require more RAM? If so, which ones? Have all Windows systems been updated with their latest service pack? Have any configuration changes occurred during a stipulated period? If so, when and what are the details? Could a particular configuration change have induced a drop in the performance of the system or application? Can any difference be noticed in the configuration of two components of the same type? If so, could this difference be the cause for the poor performance of one of the components? 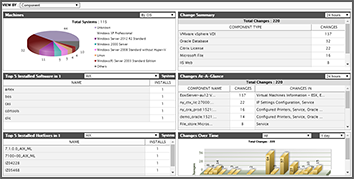 The eG Enterprise configuration and change monitoring functionality is supported for Windows, Solaris, Linux, HPUX, AIX, OpenVMS and AS/400 operating systems, VMware vSphere and Citrix XenServer virtualization platforms, and applications including Citrix XenApp, Microsoft Terminal servers, Oracle database servers, Microsoft SQL, Microsoft IIS, and Apache web servers.